Every autumn, I have the same dream. It usually happens in early October, just after the aspen and cottonwood begin to yellow and southbound geese fill the pond. In it, I am skiing. There is no sound in this dream, just the slow thumping of a regular heartbeat. The snow is perfect, waist-deep and smoky-light, and flakes fall like popped corn down alleys defined by mossy-sided pine. I am alone, at first, skiing fast down an endless pitch. My turns are precise and powerful, my line sure. I soar and dip, razing the mountain like a barn swallow with snow exploding from my wings. I am eventually joined by old friends, silently swooping beside me, braiding their turns into mine like physical expressions of pure joy. But I am an observer in this dream. I feel nothing. No cold wind at my back. No dampness on my face. No burning in my legs or weightless float between perfectly scribed turns. It disturbs me, and in my dream I falter, nearly go down. But the effort produces a tingle—a crescendo rising, a wave breaking, a taut wire singing with tension. I am at the brink of sensation when I crash. The world goes white, then black. I wake in the dark, burning with anticipation, with my heart beating loud in my chest, and I know: Ski season is coming. The essential truth and magic ingredient of skiers’ passion is simple: we cannot remember or recall the sensation of skiing. We remember pleasure. We remember laughter. But no matter how long we’ve skied, we are unable to faithfully recall the feeling of skiing. And so we must wait. In the early season, anticipation is currency. We gather it around us, share it with friends. We become high on it, sometimes ill with it. Anticipation is half the fun of skiing. 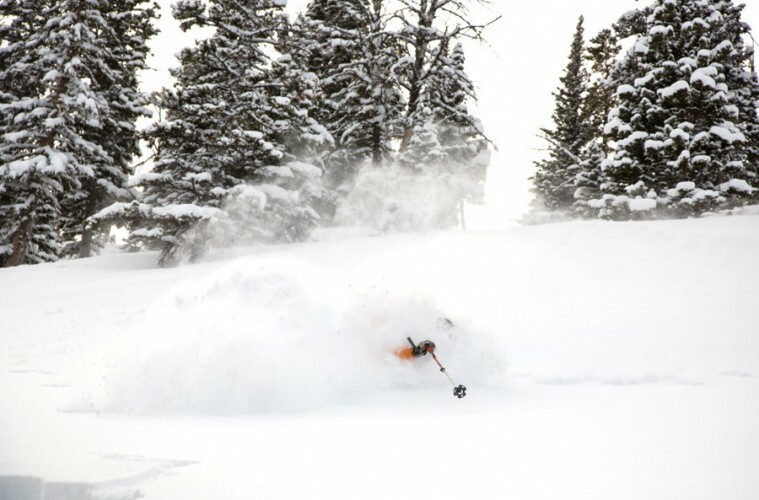 And when it finally happens, whether on a single white ribbon at some high, cold resort, or in the deepest powder of the season, delivered by a freak October storm, our first turns of each season are always some of the best. It happened last year on October 5th, after just such a storm delivered four feet of snow virtually overnight in the Tobacco Root Range outside my home in Bozeman, Montana. It was midwinter cold that morning, when my partner, Simon, and I set out to explore the new season. The snow was so deep, even four-wheel drive failed to deliver us to the trailhead, and so we skinned for extra miles beneath frigid clearing skies. Thermal springs steamed beneath fresh pillows of fluff as we skied past; our skins whirring loudly on the cold snow like cotton on leather. Simon developed a blister within two miles, but didn’t complain—the day was too beautiful. We climbed over logs and rocks, rounded by accumulation. And as we climbed, the snow grew even deeper. By the time we ripped our skins and drank a celebratory beer—it’s October 5th, for crying out loud!—the sky was clear and everything had changed. It was a winter snowpack, four feet deep and right side up. We were 3,500 feet above our truck, and there was nothing but bottomless powder between. Standing on skis again for the first time in months is like returning to a childhood home after years of absence: it seems unchanged, but the details are blurry. Skiing’s physical motions are familiar—the mechanical processes come back in an instant: Roll your ankles; angulate from the hips; pressure your tips. But upon pushing off, the sensation of gravity prevailing over friction is fresh and exaggerated in a way that sends tiny, giggling vibrations to the pits of our stomachs. The wind is louder in our ears than we remember, and the speed feels more reckless. The security of a carved arc; the weightless, frictionless glide of skis planing in powder—the surprise and delight of the season’s first face shot—everything old is new, and better. So it was in the Tobacco Roots last fall. Simon and I skied a steep, gladed pitch that’s all rocks and deadfall in the summer months. But in one storm, the ragged earth was erased, replaced by smooth contours and drooping edges. It took four turns to remember how to ski. The first sent me into the back seat, so fast and unfamiliar was the acceleration. The second pitched me forward with too much edge. The third and fourth were shaky slices between trees drooping under Seussian loads of snow. The fifth turn—my God! It was deep in a sense that transcends sport. And I remembered everything in a flash of what I can only call déjà vu. It seems crazy that we could ever forget something that brings us so much happiness. “It’s like riding a bike,” some people say, “You can never forget.” And they’re half true. But the cliché overlooks a critical distinction: we all remember the how, but like the rich, bitter flavor of dark chocolate blending with the sweetness of red wine, or the scent of upturned earth in the spring, we quickly forget the truth of why we ski—because of the way it makes us feel. Early winter has a feeling all its own—the elements seem more elemental. The cold is fresh and bracing, but unsure of itself. It doesn’t attack with the unwavering confidence of January. The wind blows, but without the Arctic bite of February. Long shadows slink across the high peaks like cartoon villains, tip-toeing dramatically toward winter. And the snow…. Before the season begins in earnest, before the industry marketers get their claws into it with grooming reports, and “packed powder” conditions, the snow is unexpected, unsoiled, and valuable. It falls with uncommon purpose in the early season. Skiing can make a large person feel graceful. It can make a small person feel powerful. It gives children incomparable freedom, and the elderly a feeling of youth. It can make us feel a rush of adrenaline or the calm of absolute control. It is a community and it is a place to be alone. Skiing is all things to all people, and this is why we wait. And so our amnesia is a perennial gift. We are given the opportunity to relive our beginning—the genesis of our passion—each and every season. We may curse the wait and burn with anticipation, but ultimately this is what fuels us. We share our stories and make our plans and wonder aloud what might be possible. And on a certain cold night in October, some of us will dream of the day when we’ll swoop once more through mossy-sided pines and feel everything it means to be a skier. —Drew Pogge is owner and lead guide at Bell Lake Yurt (belllakeyurt.com) near his home in Bozeman, Montana. His award-winning stories appear regularly in titles including Outside, Skiing, Backcountry, National Parks, and many others, and he is an editor at several outdoor titles, including Backcountry, Outside Bozeman and Stokelab. He also teaches college writing and prepares a mean bison curry. This is the kind of writing I aspire to. Well done, and thank you. You put in words what i feel. What a great read. Thank you Drew!